Learn to ‘Work Smarter’ from Dr. Reid! Are you facing challenges as a college student? Struggling with managing a social life, homework, and exams? This book is a must-read for those determined to overcome the challenges nearly all college students face. Dr. Reid provides easily adaptable solutions for college students to secure their success! 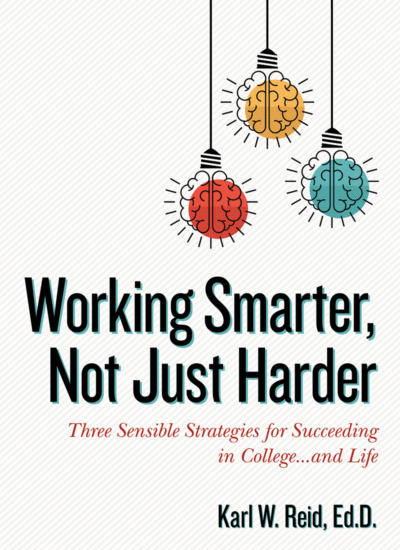 Born out of my experience as an engineering student, researcher, and an associate dean, and based on a series of workshops I taught at MIT to improve student achievement, I wrote Working Smarter to equip students with the attitude and practical strategies needed to get better grades and become lifelong learners. Some years after I became a college administrator, I invited a good friend, Donna Johnson to lead a workshop for incoming college students with whom I worked at my university…. Excellent read for parents and future college students. Enjoyed learning about Dr. Reid's interesting background and journey. Excellent and realistic. Great recommendations for success in College. I read this book and think that it is a great resource for new college students. I am going to look into getting copies for groups of incoming students for the program that I run at my university. I am familiar with some of the references, and I like how this book builds upon other options such as the Guaranteed 4.0 method.